The dialog Options for Target — Debug — Manage Component Viewer Description Files allows you to add debugging support for Software Component objects or events. The objects and events are defined in Component Viewer Description files (extension *.scvd). Component Viewer Description files can be delivered with Software Packs or can be created by the customer. 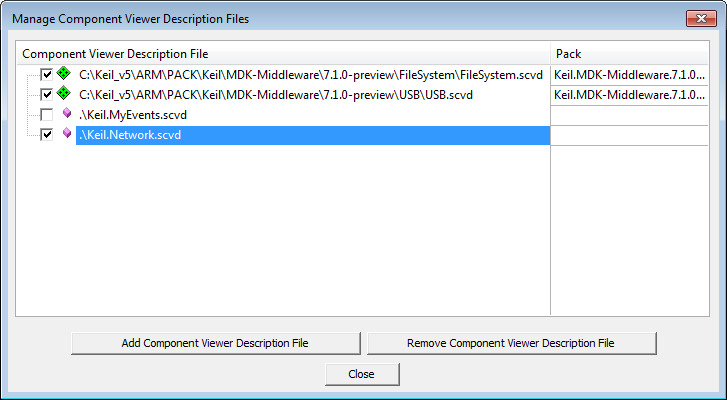 Keil delivers Component Viewer Description files starting with the Pack Keil::MDK-Middleware7.1.0. Files delivered with Software Packs are included automatically into this dialog when the described Software Component is selected in the dialog Manage Run-Time Environment. The debug information can be analyzed with the Component Viewer and the Event Recorder. Component Viewer Description File List of description file names. The entry includes an absolute or relative path to the description file. Enable or disable a description file with the checkbox next to the file name. Enabled files will activate the delivery of debug information. — delivered with a Software Pack. — created by customer. Not delivered with a Software Pack. Pack Shows the Software Pack name that delivered the description file. An empty field indicates that the description file was not delivered with a Software Pack. Add Component Viewer Description File Open a standard dialog to navigate to the location of the description file and include the file to this dialog. Remove Component Viewer Description File Delete the selected description file from the dialog. Close Close this dialog. Click OK on the next dialog to save your changes. No error or warning messages are shown for description files that cannot be found. Refer to Using Component Viewer and Using Event Recorder for details.